Boston’s National Bike to Work Festival at Boston City Hall Plaza in May 2017. 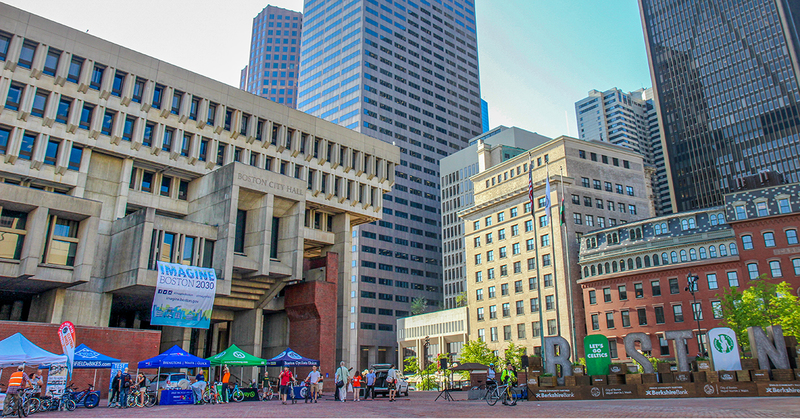 One of our favorite events is Boston’s National Bike to Work Festival, when cyclists ride into City Hall Plaza in convoys, bright and early, ready to start a fun morning. Breakstone, White & Gluck is pleased to participate again this Friday morning. Our attorneys will be out at our Project KidSafe tent, greeting cyclists and workers who come out to celebrate and learn about cycling in Boston. Please come say hello. Our attorneys can inspect your bike helmet and we are offering our Project KidSafe helmets free to cyclists who need one (available on a first-come basis, while supplies last). In addition, cyclists can sign up for free breakfast and other freebies, plus learn more about the new Blue Bikes. If you are interested, please read the City of Boston’s e-mail announcement. Cyclists can sign up to ride into the festival on one of the many convoys coming in from all over the area or just ride in on your own. You must register by Wednesday to receive an event t-shirt and take advantage of the free offerings. TIME: 7 a.m.- 9 a.m.
Before we continue, we want to mention all the activities being offered to cyclists this week and month. May is National Bike Month, sponsored by the American League of Bicyclists. As part of National Bike Month, National Bike to Work Day will be celebrated in Boston and communities across the U.S. Here in Massachusetts, MassBike is also presenting Bay State Bike Week from May 12th to May 20th. Check out the Bay State Bike Week calendar and the MassCommute Bicycling Challenge 2018. Expect to see lots of blue as the City of Boston celebrates the rebranding of the public bike share system at Friday’s event. The metro-Boston’s public bike share system is owned by the municipalities of Boston, Brookline, Cambridge and Somerville and operated by Motivate. The green Hubway bikes will be phased out, as Blue Cross and Blue Shield of Massachusetts becomes the new title sponsor. New Balance was the original title sponsor for the system, which launched back in 2011 with 600 bikes. The system has since tripled in size. Blue Cross and Blue Shield plans further expansion, and the system could reach 3,000 bikes by year’s end. According to the City of Boston, Blue Cross and Blue Shield will offer free rentals on Friday. Read this announcement to learn more. You can also visit www.bluebikes.com and download the app if you are interested. Breakstone, White & Gluck is a Boston personal injury and medical malpractice law firm representing plaintiffs. With more than 100 years combined experience, our lawyers fight for justice for those who have been injured by the negligence or wrongdoing of others. Our law firm is committed to bike safety and preventing head injuries through our Project KidSafe campaign. Wearing a helmet is required by law for cyclists who are 16 and younger in Massachusetts, though it is critical for cyclists of all ages. Please commit to wear a helmet every time you ride.